Based in the company’s Bangkok headquarters, Mr Lim Boon Kwee oversees the operations of Dusit’s global portfolio of hotels and resorts across four continents. Responsible for the financial and operational responsibilities of Dusit’s Hotel Business Unit, both at the corporate and property levels, he oversees corporate functions in Sales & Marketing, Rooms, Food & Beverage, Engineering and Technical Services, as well as supporting the Development team to expand the company’s global footprint. 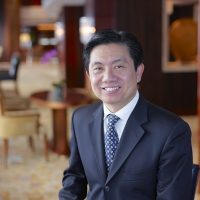 Mr Lim joined Dusit International in March 2013 as President of Dusit Fudu Hotel Management Company Ltd., Dusit’s joint venture company based in Shanghai, China. With his appointment on 1 February 2016, the office of the President of Dusit Fudu has been integrated with that of the Chief Operating Officer of Dusit International for better alignment between the two companies. Prior to joining Dusit, Mr Lim was the Senior Vice President of Millennium and Copthorne for Asia. He possesses an impressive breadth of management experience spanning over 30 years, having worked for companies such as The Westin, the Intercontinental, Sedona Hotels International, Shangri-La Hotels & Resorts and New World Hotels & Resorts. Mr Lim holds a Bachelor of Science degree in Business Administration from the University of Denver, Colorado, USA in Hotel and Restaurant Management as well as a Master of Business Administration from the Nanyang Business School of the Nanyang Technological University, Singapore.